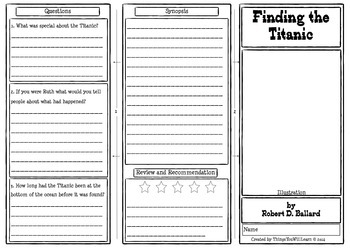 A double-sided worksheet for Finding the Titanic that tri-folds into a pamphlet. 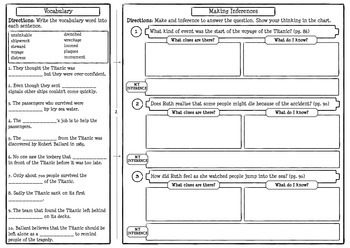 It includes an illustration section, a vocabulary practice (10 words), a making inferences activity or an opinion writing activity about the Titanic (according to teacher preference), comprehension questions (3), a write a synopsis section and a 5 star review/recommendation section. 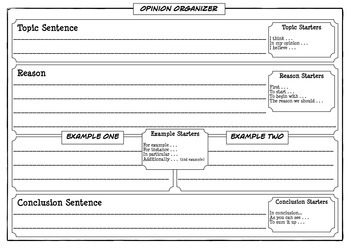 A graphic organizer with sentence starters for prewriting the opinion piece is provided also. 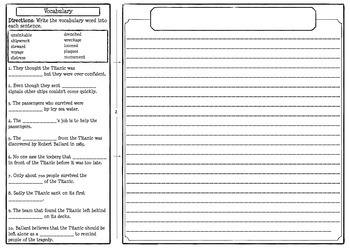 Finding the Titanic Comprehension Pamphlet by Michael Allen Kelly is licensed under a Creative Commons Attribution-NonCommercial-NoDerivatives 4.0 International License.